Indigenous people were in Beechworth when thylacines still roamed the mainland — and we have two art sites to prove it. 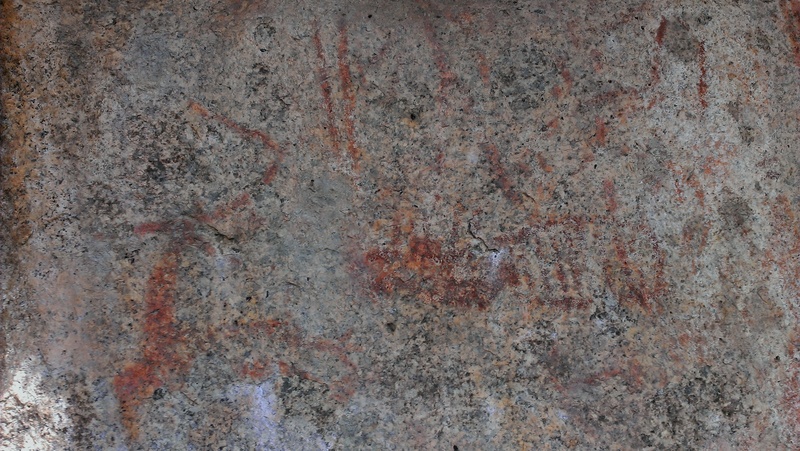 While the rock art at the easily-accessible Yeddonba Aboriginal Heritage Site is well-visited, a second, lesser-known art site can only be reached with a considerable amount of bush-bashing. You’re probably wondering why I’d start a blog about the early gold rush in Spring Creek (Beechworth) with a visit to one of the lesser-known local indigenous rock art sites. The answer is that one role of this blog is to do some myth-busting, and it’s best to start with busting the myth that Aboriginal people had virtually disappeared by the time gold mining started here in 1852. Beechworth sits in an area which was almost at a convergence of tribal boundaries between the Dhudhuroa, and Waywurru (Waveroo) speaking ‘tribes’ (the Dhudhuroa called the Waywurru language ‘Minyambuta’). These people had been in occupation for tens of thousands of years, whereas the European squatters had been, at the time of the gold rush, in occupation for a patchy 14 years. Disease and gun-shot wounds had greatly reduced the number of Aboriginal people (and that’s another story ), but they were still here. Anyone reading historical records, diaries and letters from 1852, will catch glimpses of them, living a partly Europeanised but still largely indigenous lifestyle. I first visited the rock art at the Yeddonba Aboriginal Heritage Site 23 years ago with Pangerang man Eddie Kneebone , and had returned many times since to ponder the lives of the people who’d painted a thylacine in that rock shelter over two thousand years ago. Although I’d read about it, I’d almost forgotten that a second art site existed nearby, until a good friend — who is a Chiltern-Mt Pilot National Park stalwart — mentioned that he’d been shown an art site depicting yet another thylacine in the early 90s. At one point, park rangers had even built a path to this site, but bush fires swept through in 2003, and since then, a nasty thicket of young black cypress pines and shrubs had grown in its place. After our discussion, my friend decided to relocate the site, and after half a day of bush-bashing (I witnessed his subsequent cuts and scratches), we were able to re-locate it. With my trusty guide, getting to the site on the first sunny day of Spring 2015 was a comparative walk in the park. 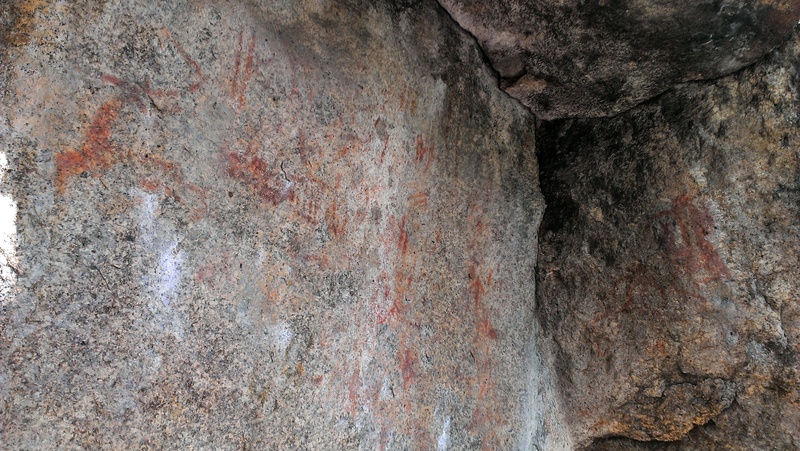 The Mt Pilot rock art site 2 (as it was unimaginatively named by archaeologists , who recorded it after its relocation in 1982) sits on granite rock faces in a rocky outcrop which faces north-east into a steep gully that drains into the Black Dog Creek basin. It has art on two panels of relatively smooth rock, which join like a book opened to 90º to form an alcove. The larger wall depicts a number of animal tracks and human stick-figures, and what I thought looks like a human figure holding a raised club or woomera to a thylacine (although drawings done by archaeologist R. G. Gunn make the human figure look more like an emu, so let’s just say it’s open to interpretation). The adjoining smaller wall features two hollow-bodied figures, which look like they are dancing. These remind me a little of figures in paintings by local nineteenth century Aboriginal artist Tommy McCrae. 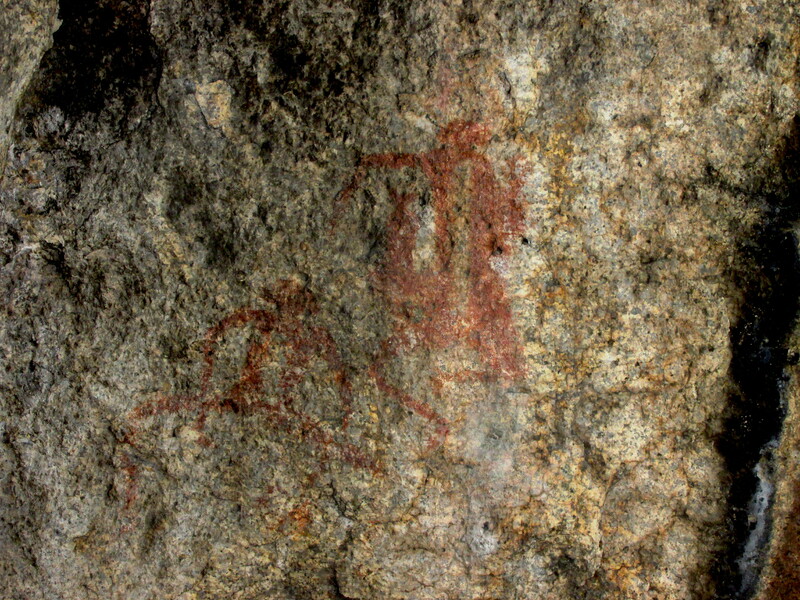 Detail from Mt Pilot 2 rock art site, with what is thought to be a representation of a thylacine on the right. Yeddonba Aboriginal Heritage site in the Chiltern Mount Pilot National Park, is located on Tovey’s Road, about 10 minutes from Beechworth via the Beechworth-Chiltern Road. I don’t have the coordinates to the second site, but it is in a rocky area on the south-western side of a steep gully, about 1300m south-south-east of the Yeddonba site. (1) The indigenous population had been decimated by a frontier war, which had come about as a series of indiscriminate reprisals in the wake of the Faithful massacre. Although few would later admit to the wholesale slaughter of local indigenous people, squatter George Faithful recounts firsthand a full day of gunning down Aborigines in Letters from Victorian Pioneers. On the note of placing actual ‘tribes’ on the map historically, I have referred to the manuscript notes of anthropologist RH Mathews (National Library of Australia), who interviewed Dhudhuroa man Neddy Wheeler in the early 20th Century. Notes taken directly from this ancestor, who was a well-known local Aboriginal identity in his day, constitute one of the most reliable sources available. Kneebone, Eddie, ‘Interpreting Traditional Culture As Land Management’ in Birckhead, J., deLacy, T. & Smith, L.J., Aboriginal Involvement in Parks and Protected Areas, Aboriginal Studies Press, Canberra, 1993. (3) A report on the Mount Pilot Aboriginal Rock Art Site, (Site 82253/001), by R. G. Gunn, was printed for the Victorian Archaeological Survey Occasional Reports Series, Number 16, in September 1983.